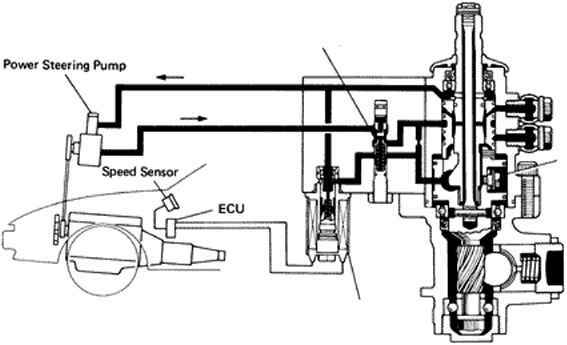 (a) Using a micrometer, measure the journal diameter of pump drive shaft. 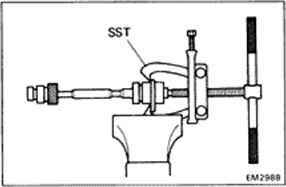 (b) Using a cylinder gauge, measure the inside diameter of the pump drive shaft bearing. (c) Subtract the journal diameter measurement from the bearing inside diameter measurement. If the clearance is greater than maximum, replace the bearing. 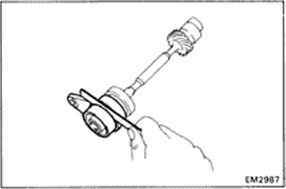 If necessary, replace the drive shaft. (a) Using SST, replace the No.1 bearing by using No.2 bearing as a guide. (b) Using SST, replace the No.2 bearing by using the No. 1 bearing as a guide. No. 1 Bearing Replacement No. 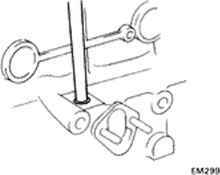 NOTICE: When inserting the bearings, align each oil hole. Using a thickness gauge, measure the drive shaft thrust clearance between the thrust plate and collar. (0.0024 - 0.0051 in.) Maximum thrust clearance: 0.30 mm (0.0118 in.) If clearance is greater than maximum, replace the thrust plate and/or collar. (b) Install the thrust plate and collar in the direction as shown. (c) Using a press, install the thrust plate and collar. (a) Drive out the bushing from the outer side of the block. (b) Drive in the bushing from the inside of the block with a suitable tool. 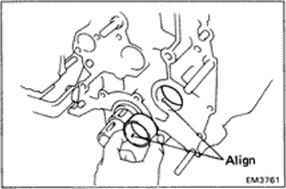 HINT: The oil hole should be positioned toward the crankshaft side. 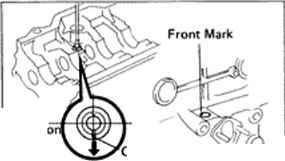 (c) Make sure the front mark of bushing should be positioned toward the front of block.